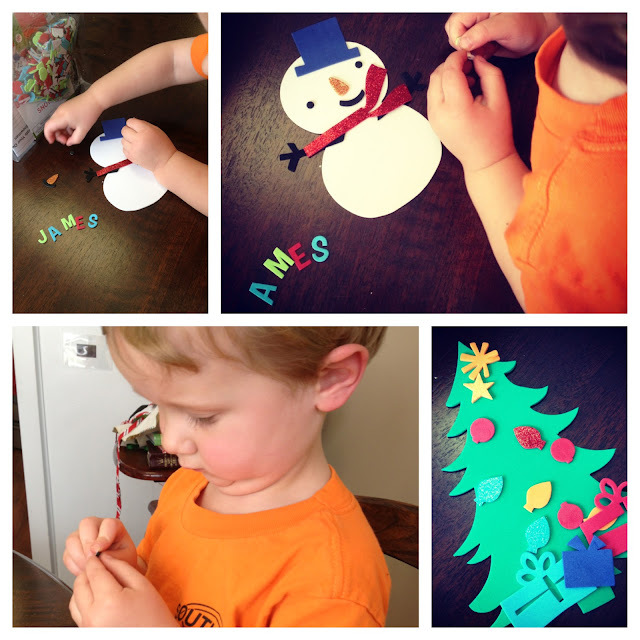 A Page Is Turned: 25 Posts of Christmas...Foam Stickers! 25 Posts of Christmas...Foam Stickers! I spotted the cutest little foam sticker set while I was shopping at Michael's recently so I grabbed it. It was in their junky little seasonal section. I don't think it's the dollar section, but it sort of reminds me of Target's dollar section. Anyway, I grabbed it and brought it home to pull out when we needed something to do. It was such an entertaining activity that I bought two more packs of these things at Target the other day. The snowman and the Christmas tree happen to come in packs of twenty so if you live nearby, seriously let me know you'd like one (or enough for a Sunday School class!) and I'll send it your way! I have a feeling we'll be decorating these periodically for a few more weeks!